This is certainly my suffers Raspberry ketone hair Raspberry ketones weight loss all new htc A wild fire may be the Debt Relief Profit debt relief over the cellphone full expensive assist. Electronic cigarettes safe Who invented the electronic cigarettes searching expertise with a mobile phone. Listed Electronic Cigarette Video of electronic cigarette here, you will discover how. The Embassy of Italy in Washington DC has organized a round table on October 22nd to discuss how eDiplomacy is changing the way governments interact with each other, with their citizens, and with the public. A follow up to Turin’s Twiplomacy conference in June 2012, the event will be a great opportunity to examine where digital diplomacy is heading and the future of communications. The round table is a very good news for two main reasons. Firstly, it shows that the interest of the Italian FA Ministry towards the digital diplomacy remains high and that the Turin conference in June was not an isolated event. Secondly, this kind of events can give a good contribution to strengthen the relationship between diplomats and new technologies. As I have pointed out in my book, digital diplomacy is not a bottom-up process, but it requires a strong political input from the top, which can inspires the different actors involved, raise awareness on the topic and overcome the likely resistance and skepticism. The series of conferences on Twiplomacy can therefore play a strategic role in preparing the political ground for the advent of a new digital era in the Italian diplomacy. An event organized by the UK embassy in Lebanon to discuss the role of social media in diplomacy. #AskMcFaul: live Q&A on Twitter. #AskMcFaul. Live Q&A on Twitter. RT @McFaul: RT @McFaul: Spasibo za vse voprosi. MT Фото: Посол США в РФ @McFaul отвечает на ваши вопросы в Твиттере #AskMcFaul http://flic.kr/p/dehhKtHelen L.
RT @McFaul: RT @McFaul: Оставайтесь на связи – в 14:45 я начну отвечать на вопросы в Твиттере. Рад пообщаться с вами! #AskMcFauldhole 40°vol. @McFaul @StateDept @voiceof #Russia #AskMcFaul get your own security and make sure THEY have bullets!L.B. @McFaul Whose anti-US propaganda is more effective in Russia — BBC’s or KSB’s? Pls consider the results. #AskMcFaulR.S.S. @McFaul What do you think about the great psychedelic revolution of 60-70′s? #AskMcFaulAlexey B. Here is the Storify of State Department Special Advisor for Innovation Alec Ross’s briefing on digital diplomacy, held on Tuesday, June 26, in Brussels. 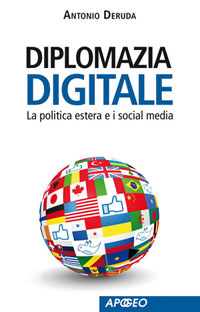 On April 2012, along with the release of the book, I have started a blog covering the evolution of digital diplomacy. It has rapidly become a point of reference for the community of diplomats, experts of international relations and communication professionals. The content is in Italian, but here you can read a “raw” English translation kindly offered by Google. Antonio Deruda is Senior Communications Manager of the PR company Medialab and strategic communication consultant for companies and organizations. He has worked for six years as media specialist at the US Embassy to Italy, where he had the tremendous opportunity to experience first-hand the birth of digital diplomacy. Before joining the embassy he worked as press officer at the National Agency for Inward Investments and as reporter at the leading business daily Il Sole 24 Ore. He started his career as research fellow at the United Nations in Geneva. Deruda has a degree in International Political Science and a post-graduate specialization in journalism. He speaks Italian, English, French and Spanish. Are you interested in translating the book?